The Mirage III (or Mirage 3) was the French answer to a requirement for a supersonic jet fighter aircraft in the fifties. It was fitted with a large delta wing which became a trademark for the famous Mirage series. 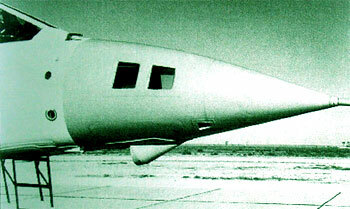 Delta wings were used beacuse of their good high speed capabilities at the cost of low speed field performance. You will find no horizontal stabilizer on this plane! The Mirage III can be considered a competitor of the American Lockheed F-104 Starfighter and adversary of the Soviet Mikoyan MiG-21 in the Cold War. Of the Mirage III various variants appeared including the Mirage V ground strike fighter. Usually the engine was a SNECMA Atar 09 version with afterburner. Intakes have a moveable half shock cone. 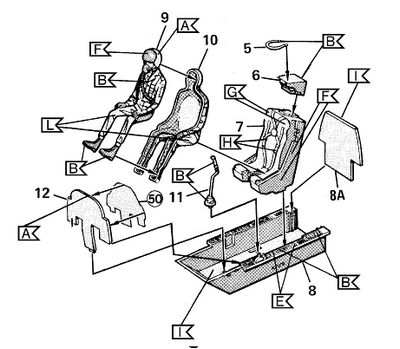 The ejection seat is usually a Martin Baker RM4 seat (licensed built by the French Hispano Suiza). Usually canon armament was two 30mm DEFA cannons below the intakes. Mirage IIIB was a two seat version of the A with no radar and a fuselage 60 cm longer to seat the crew. It first flew October 1959 and 61 were built (most for French Armee de l'Air , Peru got 2, 2 BL for Lebanon, 3 BS aircraft for Switzerland, 3 BZ for South Africa). The Mirage IIIC was the main first operational all weather interceptor and flew first October 1960 and had a Cyrano Ibis radar. 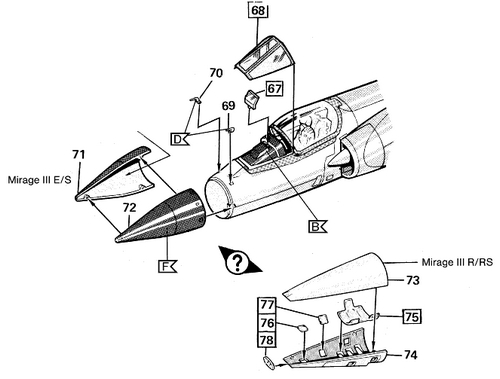 Optional was SEPR 841 rocket for dash speeds below the lower rear fuselage. Usually one missile Matra R.530 was fitted and often two 30mm guns. Ground attack missions were also possible. First order of 95 for French AF and also for Swiss AF with a total of 244 built, including CJ for Israel with different equipment from 1963, 16 CZ aircraft for South Africa. Mirage IIID was the two seat version of the O for the RAAF. Some also delivered to Lebanon, DP with 3 aircraft for Pakistan. Mirage IIIE version was the long range fighter bomber with the SNECMA Atar 9c engine and optional SEPR 844 rocket. The E had a fuselage that was 30 cm longer in front of the intakes as compared to the earlier C versions. It is easily seen at the cockpit sides. Often a Doppler is fitted below the nose and the radar was the Cyrano. Over 360 aircraft were built with first delivery started beginning 1964. Sub-versions of the E include: EL for Lebanon, EP for Pakistan, and EZ for South Africa delivered 1965 period. The Mirage IIIO was for Australia and had some other systems. Mirage IIIR is a reconnaissance version of the E. It had 5 Omega camera's in the nose and no radar. The RD had a Doppler below the nose and could carry big 370 gallon tanks. Other deliveries of the R were 3 RP for Pakistan, 17 RS for Switzerland. 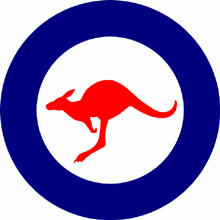 The RZ was similar to the RD and for the SAAF. 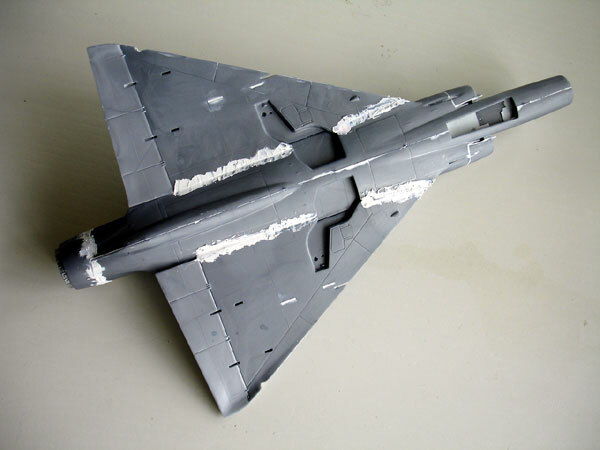 Mirage 5 or Mirage V is a ground attack version derived from the E and no radar fitted flying under VFR. It had simpler systems and probably a simpler landing gear but had no less that 7 stations to carry stores. Some could also fly as interceptors with the Sidewinder missile. The Mirage 5J was for Israel. Mirage 5BA was for Belgium with again no radar but with a better navigation system. The BD was the two seater for Belgium and the BR the recon version with 5 Vinten camera's. 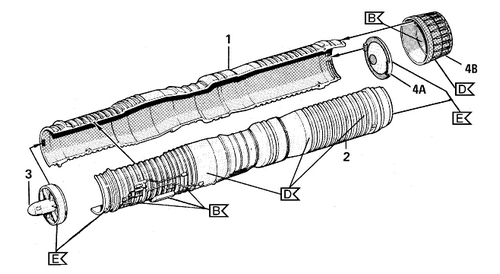 It had an arrestor hook and SABCA made the type in license. Later on, it got ECM systems and flare dispensers. The Revell kit in 1/32 scale of the Mirage III was issued long ago in 1975 and appeared in various kit boxes. 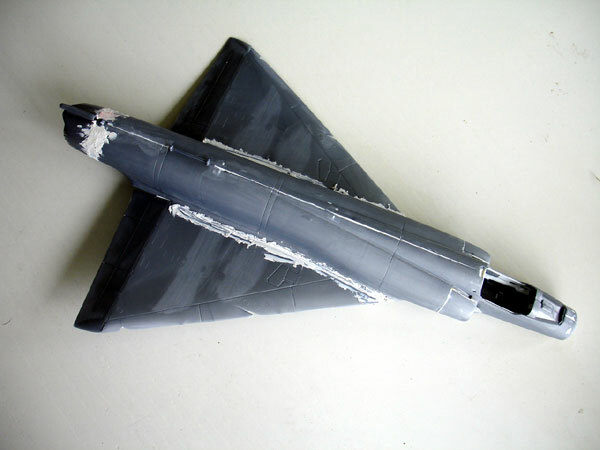 The Mirage III in the kit is of the later Mirage III series. 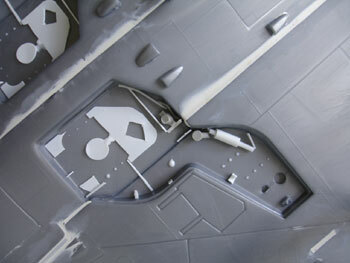 The basic shapes are all there in the grey aluminium coloured plastic with mostly raised panel lines. You get an engine to be fitted into the fuselage and a selection of stores with fuel tanks, bombs and missiles. All parts are rather basic and crude in some areas like the missiles. Recently, the some kit popped up as Revell re-issued it in several boxes like the Belgian memphisto scheme (on the left). It also came in a traditional box (# 00185-389N) seen on the right. 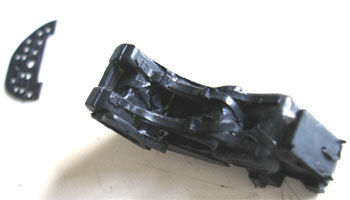 The kit parts need cleaning up and carefull removal of their sprues so use a good cutter here. Remove the flash and use sand paper to smoothen things up. The canopy parts are thankfully cristal clear. Instructions of Revell are acceptable and typical of the age with some colour info. Colours given are generic in nature. A couple of models will be made of this kit. First I selected to make an Australian test Mirage IIIO of the ARDU (Australian Research and Development Unit) test squadron based in Edinburg Australia 1985. This plane has some special modifications like camera windows in the nose. It sports an attractive white and orange livery. 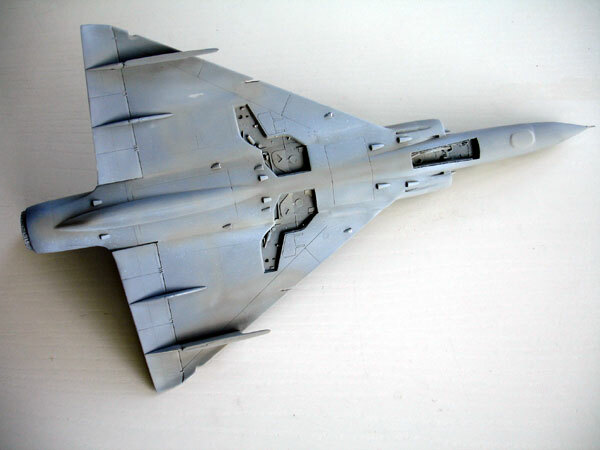 The other Mirage IIIE model will be made in parallel and will be for a traditional French Air Force Mirage in a metal finish with red detail markings. Obviously this must simply be in the collection seen in many pictures in the past! (I will try to make a model of the French AF of EC 2/13 ALPES as based on Colmar France in 1965; this means I have to search for decals or make my own). The kit comes with a simple engine. I installed the engine only to get a long exhaust pipe, but used only half the pipe length. Prior to installation, I added some details at the afterburner. 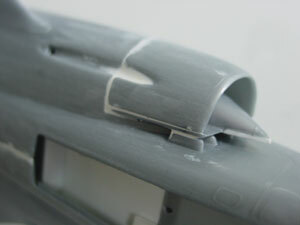 The rear part of the fuselage needs some sanding to get a smooth result. 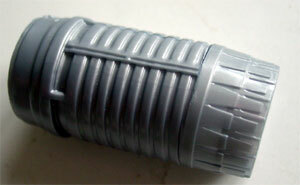 Although the exhaust itself is a bit simple, I will use it and use various metallic colours here. Alternatively you may buy an aftermarket set that provides you with more details on the insides on the exhaust. 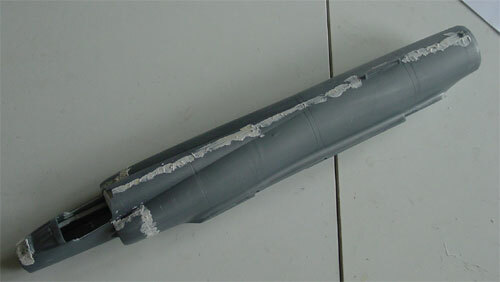 If you make a Mirage IIIO, it may be an idea to get a F-104 engine exhaust from another kit. The kit's cockpit and the ejection seat is very basic and needs a lot of work. 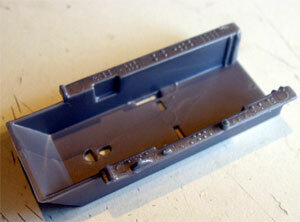 First, I got a resin replacement seat from High Planes (kit AC3201). The seat looks very similar to a Martin Baker seat as found in many Hunters. The edges on the cockpit sides were made thicker with plastic card. The instrument panel was made from card and I will use home made instrument decals to add detail. Also I added detail onto the side panels like a throttle. 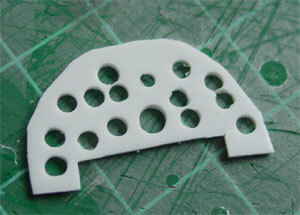 The rear bulkhead was also a bit detailed. Overall, the cockpit is small and pretty dark, I used "tyre black" in most areas. I made an internal "tunnel". This was an effort that turned out not really needed. The nose is a separate part and does not fit well. I needed to do a lot of sanding to get a smooth and symmetrical result. (Revell supplies you with parts for an extra option for a recon camera nose). 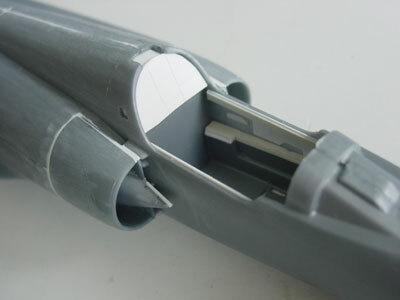 The fuselage joints needs putty and you will need to remove some ejection pin marks. Intakes are a bit simple. I added the supports between the backing plate and the fuselage. Also, the back of the triangle lip was covered with card and putty. The cockpit area, will be detailed later on. 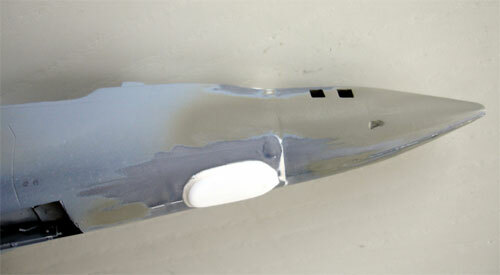 2/ I also drilled open a small hole in the starboard lower fairing at the tail of both models. Revell indicates this as decal #A39. The wheel legs need more detail and look at real pictures to improve them. The wheel wells cried for detail. I added various pieces of card and sprue. On most Mirages the doors actually are open when they are parked on the tarmac. The crude Magic missiles suggesting " Sidewinders " are best replaced! Not needed is the recon nose; the normal nose doesn't fit very well. For the model  of the ARDU, I drilled open 2 holes on both sides on the nose and added a small open scope fairing under the nose tip. I assume that some camera's are equipped in the nose. 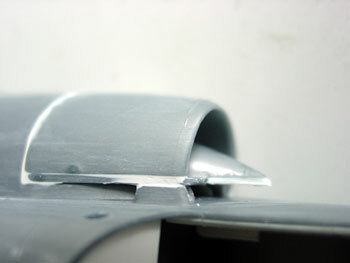 There is a need to position down the wing trailing edge flaps as they droop down for a plane parked on the ground. I simple made some cuts and scored the panellines and than bended down the flaps. When you fit the wings, you will end up with large gaps on the lower sides. Add card and plenty of putty here. Leave these for after you painted the model. 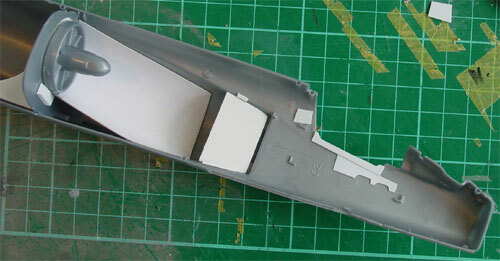 Adjust the flap fairings as you drooped the flaps; make cuts, sand off and glue at an angle. Model  was given after correcting the flaws with putty, an overal metal coat using ALCLAD II Metalizers. I used "highly polished aluminium" on the majority of the airframe surfaces and darker titanium in smaller areas. 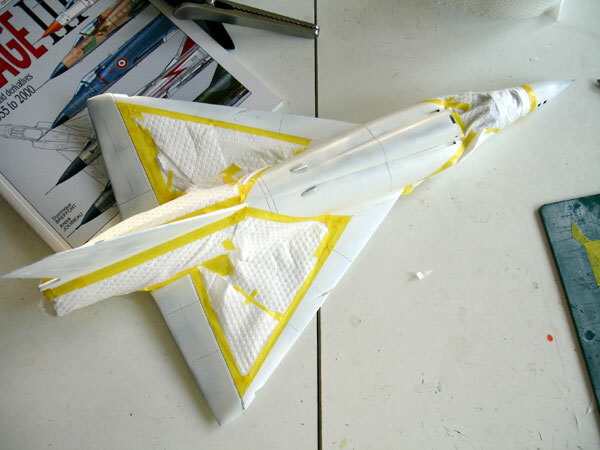 There are not that many different metal colours on the real Mirage III, masking was very limited and so this can be relatively quickly done. Buffing the coating will give a noce shine to it. Model  got the orange scheme of the ARDU test flight. 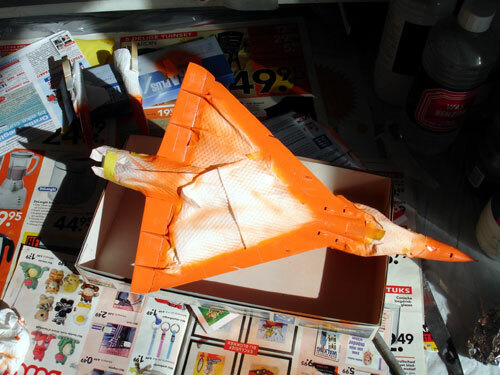 After the white satin colour (using Humbrol #130 ), the orange split pattern was masked off using Tamiya tape and the orange airbrushed using Humbrol #18. Next steps are putting on the decals and details etc.